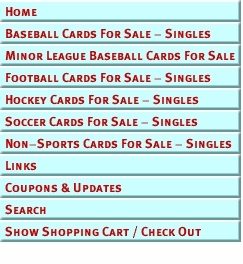 At Colleting Sports Cards Online Store, we are your expert authority on modern Sports and Non-Sports Trading Card Singles and football cards are a good part of that. If your a team collector, set builder, player collector, friend or family member of a player or have some other special way of collecting we hope we can help you add to your football card collection. Quantities of Singles available are very limited, often with only 1 in stock. If you wish more than one of the same card please email us before ordering to check availability.